Here is the waning gibbous moon near the star Antares in the southeast sky shortly after midnight on April 3. If you are looking for the moon on the evening of April 2, you won’t find it. The moon will not rise tonight until after the middle of the night – at about the same time that the constellation Orion’s bright star Betelgeuse sets in the west. Tonight, from about one after midnight until dawn, the moon will appear in front of the constellation Scorpius the Scorpion, near the bright ruddy star Antares. 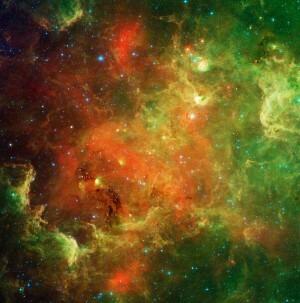 This variably bright star well depicts the Scorpion’s beating heart. 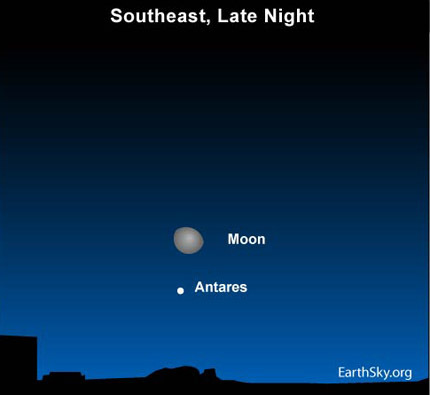 Look for the moon and Antares to lurk low in the southeast about one hour after midnight, and to scurry westward throughout the night, finally to appear above your southern horizon in the dark hour before dawn. According to sky lore, the constellation Scorpius is related to another constellation, Orion the Hunter, which can be found descending in the west each evening now. It is said that the Scorpion’s sting put Orion to death. The gods, wanting peace to reign over the heavens, placed the Scorpion and Orion on opposite sides of the sky. That is why you can never see the constellation Scorpius and the constellation Orion in the sky together, at the same time. At this time of the year, the Mighty Hunter appears in the southwest sky at nightfall and sets beneath your western horizon by around midnight. Once Orion departs tonight, Scorpius will be rising in the southeast with the moon in its midst. Because Orion sets 4 minutes earlier daily, he will be lost in the sun’s glare by June. With Orion dropping out of the night sky, Antares will then shine from dusk until dawn!